The Mermaid Ranch: Living it up "Hic-Ville" - one Apple Crisp at a time. 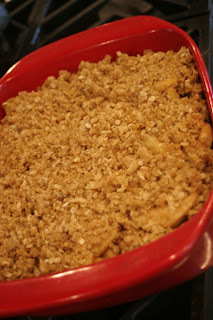 Living it up "Hic-Ville" - one Apple Crisp at a time. This a five gallon bucket of apples. Among other random listings, this is the stuff you find on Craig’s List, up here in" Hic-ville." When you go to get your apples, there is a five gallon bucket and half waiting and a note saying, “Sorry for the spots we had early rain this season, please leave $5 in the box.” This is the stuff I love about small town living. I also love that Aqua Man, took it upon himself to find these, pick them up and bring them home for the “horse he did not want.” (Tough guy, remember.) However, what Aqua Man does not realize is even our two thousand pound baby will not be able to eat all these apples before they go south. After you peel and slice your little heart out (this is really hard for me to do because I have a very short attention span) put all the sliced apples in a bowl. Mix the white sugar, 1 tablespoon flour and ground cinnamon together, and mix in apples with 1/2 cup of water. Be sure all the apples get a nice coating. Put apple mixture, in a casserole dish or baking pan or ramekins. Mix up all the ingredients for the topping (try not to put directly into your mouth) and crumble all over the apple mixture. Bake at 350 degrees F (175 degrees C) for about 50 minutes. In roughly 60 minutes you will need to obtain, steal or borrow a gallon of vanilla ice cream. Serve Apple Crisp warm, to only your favorite people, with big scoop of vanilla ice cream. This recipe is about as simple, as simple gets; kind of like "Hic-Ville." As someone who has lived all over the place, "Hic-Ville" has some definite advantages at times! I have to say that it was delicious!!!! You aren't making this staying skinny thing very easy with all these yummy recipes.